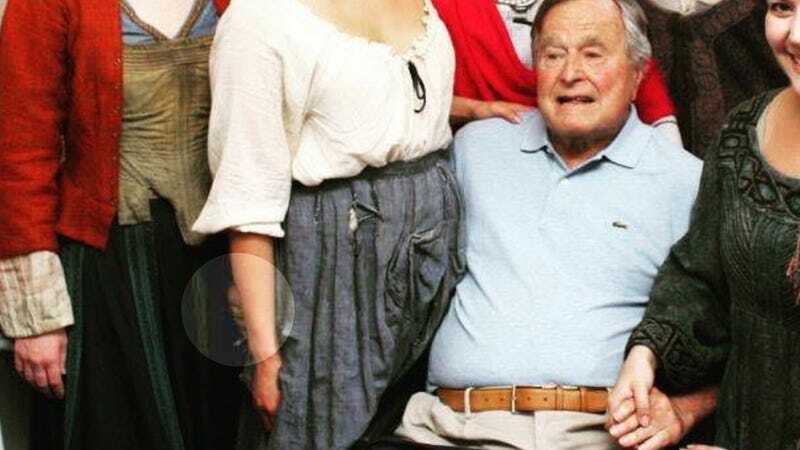 In reporting out the tip, I found two actresses—Lind and Grolnick—who had accused Bush of groping, and also two Twitter users who, on April 4, 2014, made reference to the “David Cop-a-Feel” joke. At the time, these people either didn’t respond to Deadspin’s requests for comment, or could not be reached. Today, in the wake of the Lind story, I tried again, and Grolnick wanted to tell her story. Grolnick says others in the room “laughed politely and out of discomfort.” Former first lady Barbara Bush was among those nearby. “[She] said something along the lines of, ‘He’s going to get himself put into jail!’ to which we laughed harder,” Grolnick says. Grolnick—who consented to have her name used in this post, but requested we not include the name of the theater where the incident occurred—says she did more than put out word of the incident on Instagram, however. She told friends and family, too. And she was heartened that, despite the power differential between the accuser and the accused, there were no hints that she was making anything up. “Nobody didn’t believe me,” she says. “I just thought, ‘Whatever. He’s a dirty old man,’” she says. But recent trends in truth-telling in entertainment and media, and empathy for Lind, changed her mind about the propriety of letting the matter die. Know anything we should know? Contact the reporter at dave.mckenna@deadspin.com, or through our SecureDrop system for extra security.